The Spanish general election will take place in 10 days. 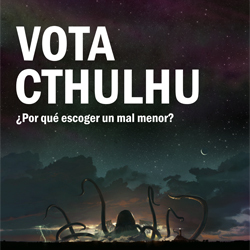 Since my country is so fucked up, and all human candidates are either retarded, senile, or both, the Great Cthulhu finally woke up in R’lyeh to offer the only sane political option for any Spaniard right now. He is the Leader for the Non-Euclidean Party (PNOE in Spanish), a new political party that will make the end of our days less stupid, more meaningful, and much shorter. Vote for Cthulhu. Why to choose a lesser evil? I finally have a Real Leader to vote for in my country. Vote for PNOE on 11/20! Party in R’lyeh to celebrate the end of our days!